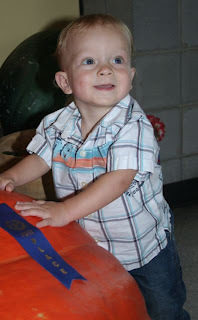 So Brayden had his first birthday last Friday October 10th! It was so fun just to celebrate him all day long. Not to worry about what I need to be doing or getting done but just to take him some fun places and watch him laugh, smile, try new things, and even be a little timid about them. We hung around the house in the morning so he could get his nap in. Shelley came over around lunch time and we left to go to the Farmer's Market. My mom was in town and so it was Nana, Grandam, Brayden, and I! 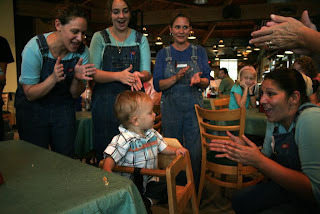 We ate lunch there and they sang to him. He had a look like "what are all these folks standing around me singing for?". Then we went over to look at and touch the pumpkins. 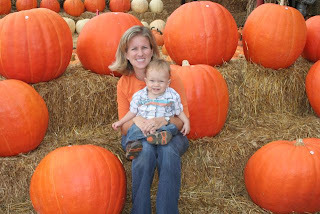 We went there last year with Kim and Palmer but we went on Halloween and most of the pumpkins were already gone. There were LOTS of pumpkins and gourds of all sizes. We enjoyed touching and looking at them. 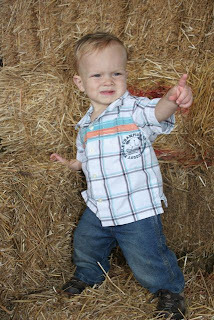 He even climbed on the hay. It was a bit prickly so it took him a few minutes to like it. It is just like how he acts on the grass! 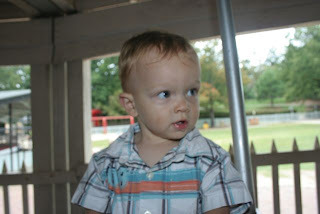 After we bought some gourds and 2 pumpkins we headed over to Pullen Park. We rode the train for the first time. It was kind of loud at first so he was a little apprehensive. 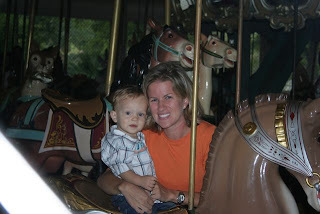 Then we played on the swings and rode the carousal. It was fun watching him try some new things. There they also sang Happy Birthday to him and gave him a little sundae with 1 candle! We went home and he got to open his presents from Uncle Jonathan and Ms. Kim and Keeton. Two presents sent all the way from Colorado. On Saturday we had a birthday party at our house. You can check out flickr for more pictures being updated very soon! Happy birthday，I will be one month old baby of the family!